So the previous episode leaves us with Geillis and Claire being arrested at Geillis’ house, after she refused to run as Claire insisted she should. This one starts out with a startlingly different scene, one of a large flock of birds exhibiting their flying acrobatics over the top of a beautiful lake. (The point of this scene becomes apparent later on). We are then torn from this scene to one of Claire and Geillis being thrown, not too kindly, into the thieves’ hole, bouncing off the rocks on their way down. Claire cries out for anyone else who might be down there, but all she finds are some very large rats. Both women pull back quickly to avoid these sizable vermin. Their initial fear wearing off, the blame-throwing begins, with both throwing accusations and fiery words at one another. Geillis is, understandably, suspicious of Claire’s timing, while Claire can’t believe Geillis wouldn’t flee when she told her to. Claire immediately recognizes who orchestrated her being there when Geillis was arrested, her blonde, teen rival for Jamie’s heart, and bed, Laoghaire Mackenzie. She explains this to Geillis, pointing out that the young girl had watched them being arrested, as well. Geillis, instead, accuses Claire of not having kept her secrets, which Claire quickly corrects by pointing out that the housekeeper knew her secrets, too. Geillis asks if Claire thinks she a witch, too, which she denies. She doesn’t pull punches, though, and points out that, while she’s not sure if she killed Duncan’s wife, she knows Geillis killed her husband, Arthur. This was through the use of poison, though, not witchcraft. Geillis is silent and turns away, confirming Claire’s accusation. They sit for a few tense moments, not speaking to one another. Finally, Geillis admits her guilt, revealing that she had wanted Arthur gone before the baby had even started to show. The baby begins moving around and Geillis sits by Claire, taking her hand to place it on her belly so she can feel the child kicking. She remarks that the child will be a boy, again, as is Dougal’s other secret child, Hamish. Claire snatches her hand away and moves to another part of the hole, obviously not ready to be back on good terms yet. At this point, the guard throws some bread down through the grate for them. You can see it still raining through the bars of the grate, as well. She calls for help, moving to where the guard can see her. She explains to him who she is and who her husband is, but the guard doesn’t believe her, remarking that, if that was true, then he’s King Arthur. Geillis makes a smart comment about this, a feeble attempt at a joke, as the guard stalks off, leaving Claire looking downcast. Geillis obviously feels guilty about the part she played in Claire’s being there with her and tries to reassure her. Claire continues to stare off, looking lost and hopeless. Is she thinking about the promise she broke to Jamie upon their parting? Or simply the fact that she might never see him again? Geillis, unaware of what has transpired, insists that Dougal is going to rescue them. Claire, not very kindly, reveals the truth to her, that Dougal admitted their affair and the existence of the baby to Collum, and then was banished. “No one is coming, Geillis,” she tells her, as we watch that sliver of hope leave Geillis’ face. After a few moments, she picks up the bread and offers to share it with Claire, but she insists that she isn’t hungry. Again, I wonder if it’s because of the anger she still has towards Geillis, or if she is just worried sick and honestly has no appetite. Both of these would be legitimate reasons to ignore Geillis’ efforts at reconciling now. Claire wonders aloud how long they’ll be there and Geillis reminds her about the trial and people she calls ‘The Examiners’. Geillis encourages Claire to lay beside her as they sleep so they can be warmer, but Claire lies down where she is instead, on some very uncomfortable-looking rocks. Geillis lets her sulk and curls up on her own, slightly-less-uncomfortable-looking stone slab. Claire wakes the next morning, shivering, as children cry outside for the witches to burn. Geillis comments that it’s starting, trying to see through the grate, but all we see, and hear, are a crowd of unhappy people. Claire jokes about their fate as witches (i.e. burning at the stake) would be better than freezing to death. Her bravado seems to falter as a ladder is lowered into the hole and they are hauled, none too nicely, onto the street and cuffed. The townspeople are crowded around, jeering and yelling at them, as they are led to the courtroom. Some of the townsfolk are stacking wood for the fire and putting the stake into place on the platform while small children run through the streets as if nothing strange is going on. Claire is shocked when she sees it and doesn’t quite believe that all of this is real. Geillis comments snarkily that it’s not a maypole they’re watching being erected. The courtroom is just as unfriendly towards the pair of women as the streets were. They are led to their box of the court and then read their charges. The man reading the charges mentions them both by name (so why did the guard earlier seem not to know her?) and that this is a Church’s Court. He says they are responsible for the pain, suffering, and death of the citizens of Crainesmuir through their witchcraft. As the narrator, Claire admits to seeing no one she recognizes, understanding that their chances of surviving a witch trial were highly unlikely. And yet, just as she is musing about this, Ned appears, giving both of the women hope again. He demands entry and then faces off with the two examiners. Ned smiles at the women and touches his hat as he approaches the examiners. He seems anxious to help and insists that the trial is illegal based on the repeal of a witchcraft law (we assume this law made an allowance for this kind of thing). The crowd jeers, unhappy with Ned ruining their fun or revenge or whatever it is all these angry people are here for. The examiners counter that this trial is based on the Law of the Church. Ned then plays on their pride for their country by pointing out that they have disregarded English Law, but hoping they’ll still follow the traditions of Scottish Law. When the examiners agree that they are following these traditions, Ned points out that those accused of witchcraft are allowed representation, something England would not allow them, and then volunteers himself for this purpose. The crowd is jeering the entire time, but this comment quiets them. The examiners allow it and Ned smugly takes his place. The first witness called is Geillis’ maidservant. She seems shocked to see her there. The girl moves quickly, but doesn’t appear to have any fear, of either Geillis or the court. She talks about having been their housekeeper for five years. She watches Geillis before surreptitiously selling her out to the court, talking about all of the women who had come to her for remedies and charms. She claims Claire was in league with Geillis, too, but when Claire moves to deny it, she hears the details the housekeeper is giving and realizes she isn’t lying. For almost an hour the housekeeper lists all the ways that Geillis and Claire engaged in supposed witchcraft. We come back in as she shows remorse for her employer’s death and mentions Geillis singing incantations outside his room as he slept. Geillis laughs, but is obviously trying to control herself despite the outrageous testimony. The examiners watch intently during the entire testimony, especially so when the housekeeper mentions that animals are afraid to go near the house, too. Ned seems like he’s trying not to laugh, but then jumps up and jokes about taking the testimony of a cat now. Ned then cross examines the young woman. He accuses her of having been unhappy in her job, but she denies it. He refers to the time when she sought employment at the castle and insulted both of her employers while there. The girl appears visibly concerned and the examiners, both surprised and unhappy at this turn of events. The crowd laughs as they hear the names she called her employers, but she insists those weren’t the words she had used. She has obviously lost her credibility both with the crowd and the examiners. Ned refers to her testimony as “the grumblings of a malcontented maidservant.” They dismiss her with obvious disappointment. The next witness they summon is a young woman who we find out is the mother of the baby Claire had found dead in the woods. She is plainly dressed and keep rubbing her arm anxiously. The woman claims to have seen Claire take the baby from the tree and speak dark spells over him, killing the changeling child and preventing the return of her own. She lunges at Claire and several people have to grab her and pull her away. Claire insists that she was trying to help the child, which one of the examiners take as a confession. The crowd immediately chimes in with cries of ‘witch’. Claire continues trying to defend herself, calling herself a healer. Ned comes close and hushes her, insisting she remain quiet and let him do his job. He expresses sympathy to the woman, who is now calmed down, over the loss of her child, but turns things on her since she did nothing to stop Claire from interfering. Rather than become upset over this, she relents, admitting her own guilt in the matter. He comforts her with the knowledge that her own child is with the fairies and that it was the changeling who had died in the woods. He even goes as far as to say that the townsfolk should be thanking Claire, instead. This witness is also dismissed and Claire and Geillis are more hopeful than they have been. Claire wonders, though, why all of these people would be so eager to burn them as witches, as the next witness is called. This man claims that he saw Geillis out in a storm, calling the lightning down with her hands and the thunder with her voice. Claire is losing her patience again, but Geillis smirks at her, knowing how ridiculous this all is. The man goes as far as to say that the skies had opened up and he had seen Geillis fly through the air like a bird. The crowd is immediately on its feet, screaming over one another. Ned seems concerned and Claire, once more, loses her temper. She yells at the crowd while Geillis simply laughs at the absurdity of the proceedings. The examiners order Claire’s silence and adjourn things until the morning. While they are being cuffed once more, Ned assures her that there is hope, reassuring the worried Claire. He admits to her that Collum would not be pleased to know he was there amid all of this and she realizes that Collum may have had a hand in her being there, as well. Ned won’t answer either way on this, but slips a flask in her skirt as she is led away. Back in the pit with the rats growing bolder, Claire is drinking from the flask and staring at the hold above them. Geillis is holding her belly and the child within. She asks for the flask and Claire obliges. Geillis ruins the hope that Ned had tried to give Claire, insisting that they will be killed. She gives the flask back. Claire, curious and perhaps still harboring resentment towards Geillis, questions her about her choice of Dougal. It comes out that it wasn’t about money, but about politics, and that Geillis has been stealing her husband’s money for the Jacobite cause. She doesn’t even care that Dougal would be unfaithful to her, but talks about the dreams he has and what he fights for. Claire realizes that Geillis is genuinely in love with the man. Geillis, however, won’t admit it, but is clearly hurt by the fact that he followed his brother’s orders and left her and their child behind. When Claire offers her sympathies, Geillis refuses them, insisting that she would not have changed a thing, not once the Jacobite prince is back on the throne. Claire quotes Nathan Hale’s famous last words and something crosses Geillis’ face that she doesn’t catch (though those who’ve read the books understand perfectly). Geillis seems amazed at Claire’s words and laughs. When she asks her if she loves Jamie, though, she also does not answer. The next morning, Claire wakes and hears some birds in the background. She approaches the grate, yanking on it uselessly, though it succeeds in waking up Geillis. They joke about using their witchcraft to escape. There is a bird visible through the grate and Claire watches it, a peaceful and almost happy expression on her face. She calls the bird a starling and then tells Geillis a story from her childhood about going to Brighton and watching the starlings cluster together as they flew (we are reminded of the opening scene of the show). She says that they do this in order to protect one another. Geillis comments that the two of them don’t make much of a flock, even with the accusations of flight. The jailor comes and leads them back to the courthouse. The women grasp each others’ hands, realizing it could be their last day alive. Back in the courtroom, the first witness they call is Laoghaire. Things are not starting off well for them today. She talks about the love potion she had asked Claire for, playing up the emotions of things, claiming that Claire had then taken the potion herself to steal Jamie away. Again, Claire gets herself in trouble, trying to explain that the potion was not really a potion at all. Again, this is taken as an admission and the crowd there goes wild. Ned accuses Laoghaire of being jealous and broken-hearted, but instead of being silenced, she embraces these descriptions. She then brings up the fact that Claire had hit her when they had returned to the castle. The examiner asks Claire about this and she tries, unsuccessfully, to turn things on Laoghaire by mentioning the ill omen placed under their bed. Ned does not look happy with the turn of events and the crowd responds again. Claire begins yelling, blaming Laoghaire for everything. The examiner quiets her, insisting that she is embarrassing herself. Then he calls the Father who Claire had crossed before with the little boy who had been poisoned. There is ominous music accompanying his entrance and he launches into what sounds like he’s giving a fire-and-brimstone sermon, the crowd listening with rapt attention. Ned calls him out on this very thing, but quiets once more when he is given only dark looks. The Father continues, talking about the boy he had tried to exorcise. He really plays on their emotions, conjuring the tears for them as he talks about being humbled and apologizing to them for not being stronger than this witch. A man in the crowd leaps to his feet, claiming that only a servant of Satan would be able to reduce the Father to this. The crowd agrees and Claire is on her feet, screaming at them. Ned asks the examiners for time to reassess matters with his clients and is granted it. Claire looks angry, but Geillis seems genuinely afraid now. The women are taken through the angry mob into a side room. Ned admits that there is nothing left for him to do, and that their only option is for him to sacrifice one to save the other. It becomes quickly obvious which one he intends to get out of this alive. Claire doesn’t like it at all and argues with him. Geillis just watches wide-eyed at this exchange. Ned turns on Geillis with the accusations, suggesting Claire blame Geillis of bewitching her. He warns her that they’ll both burn if she doesn’t do this, but gives them a moment to talk it over. Geillis demands to know why Claire is there, knowing she’s been lying about her past, the same as Dougal and Collum knew. She even claims that is why Collum won’t save Claire. Claire finally admits that she is there by accident. Geillis is saddened by this admission, realizing that Claire isn’t there for the same reasons she is (again, something confusing to those who haven’t read the books yet). Claire says she just wants to go home. Geillis admits that “It’s all for nothing,” before Ned returns to them. 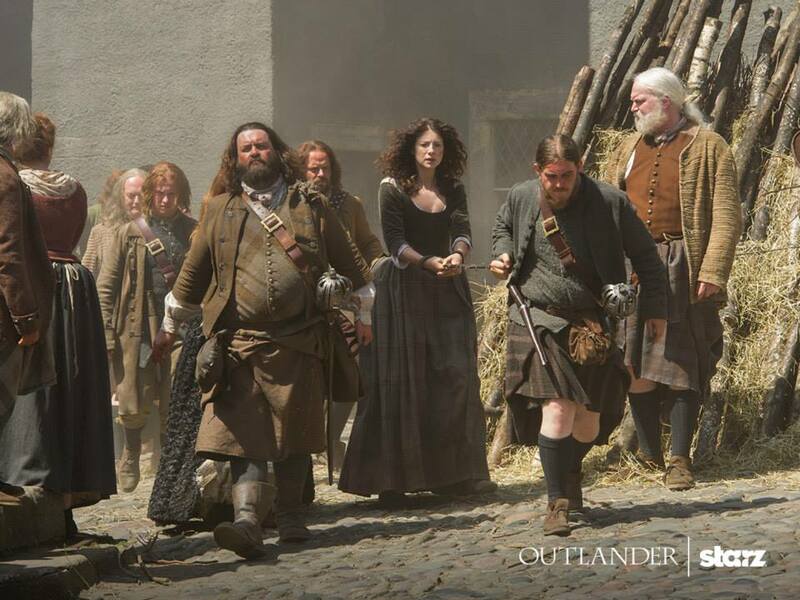 Geillis seems pissed off now, but seems to agree to taking the blame for Claire in order to save her. When Claire is called upon to speak to the court, she hesitates, looking around the room and then at Geillis. Instead of saving her own skin, she refuses and sits back down. Geillis is surprised by this turn. The examiner sentences them both to death based on a verse in the Bible. The crowd goes crazy. Ned, rather than allow this to happen, pulls a gun on the court. Time seems to slow around them as Geillis pulls Claire in close. She tells her that it’s possible and gives her the number 1968. The gun goes off as Claire tries to decipher the meaning of these clues and the crowd pulls Ned down from where he’d been standing. Claire starts screaming at them all again (big surprise), her words seeming to be curses against them all. As punishment for this, the examiner insists she be ‘stripped and scalped’. This leads to the crowd grabbing her and securing her as they spread her arms to her sides. As they prepare to punish her, Laoghaire whispers that she will dance on Claire’s ashes after all is said and done. The man administering the punishment then rips open the back of Claire’s dress and begins to whip her across the backs of her shoulders. Who should come at this point? Of course, it’s Jamie, once again saving Claire from troubles she, at least in part, contributed to. The examiner denounces him for interfering with the court, but Jamie insists that his promise to God when he married her trumps the rule of that court and pulls his sword to defend her. Geillis leaps to her feet, gaining the crowd’s attention. She claims Claire is innocent and that she herself is a witch. Claire begs her to stop, but she doesn’t listen. Geillis goes into a full confession of the murder, ripping her shoulder down to show, what she calls, ‘The Devil’s Mark’. Most of us watching know that this is actually the scar from a smallpox vaccine (both of my parents bearing such marks). This is obviously not something a woman from this time period in Scotland should have. Jamie and Claire run as Geillis completely bares herself, revealing that she is pregnant, claiming that it is Satan’s child. The crowd carries her away while Jamie and Claire get out of the city, though we never see where they take her too or what happens. Now that we know Geillis is a time traveler like Claire, so much makes sense, including her last comments. We can decipher that she was telling Claire that it is possible for her to return home and that she herself came from the year 1968. Jamie and Claire are now seen in the woods as Jamie dabs at her back with a damp cloth. He comments that the cuts are shallow and won’t scar. He respects her secrets, but asks for her honesty, which she readily agrees to. He asks her if she’s a witch, recognizing the scar on Geillis’ arm as being on Claire’s as well. Claire is hurt by his doubt, but denies the accusation. She worries he won’t believe her, though, when he learns the truth. Claire tries to explain vaccines to him and the protection it offers her, as well as her knowledge of Black Jack and the Jacobites. The only way she can explain all of this is to admit that she is from the future. He looks away, thinking, as she desperately tries to get him to believe her. He denies thinking that she’s crazy and that, though he doesn’t understand yet, he trust her. Claire is relieved as he promises to believe anything she tells him. We then see a montage of them talking as the voice over tells us that she is explaining the whole story to him. This is where I suddenly realized that our kilt-clad hero is actually wearing pants for some reason and that Claire is half-naked the entire time she is explaining herself (fixing her dress an impossibility, I suppose). Her previous attempt to run from him (which he punished her for) makes sense to him now. He is both apologetic for how he treated her afterwards and upset that she wanted to leave him for her old life and husband. She begins to cry and he comforts her. He is clearly thinking about something, though it’s unclear what. He jokes that it would’ve been easier if she’d been a witch. They kiss. We go into another montage, explaining that they ride for days, the previous conversation seemingly forgotten, or at least ignored. Jamie seems peppy, talking about Lallybroch and their future there. Claire is still trapped in a funk, though. Then we see Jamie watching her as she sleeps and kisses her gently, not waking her up. She stirs and begins to look excited, though, as he runs his hand up into her skirts. She really gets into it and asks him to be with her, but he says that he wants to watch her instead. In fact, he seems very excited by the prospect. It’s obvious through the scene that follows that he enjoys watching her as he teases her to her end. He is then watching by the water the next morning. She’s smiling for the first time in the episode. He asks her if she’s ready to go home and, thinking he means Lallybroch, seems genuinely happy at the prospect. They kiss and he nods her in the direction of a small hill, telling her to look. At the top of the hill, though, she sees the traveling stones. She doesn’t seem happy anymore, though she fakes a smile for him. Jamie leads her by hand to the stones, drawing his sword. She stares at the stone she had traveled through before as he checks things out and then returns to her side, putting his sword away. She tells him she’s not sure how she made it work before, but reaches towards the stone, transfixed. Before she can make contact, though, he snatches her away, pulling him into his arms instead. They share a tender moment. After he apologizes for not letting her go, he admits to not being ready. She agrees that she isn’t ready either. He tries to send her away, knowing that her home is on the other side of that stone. 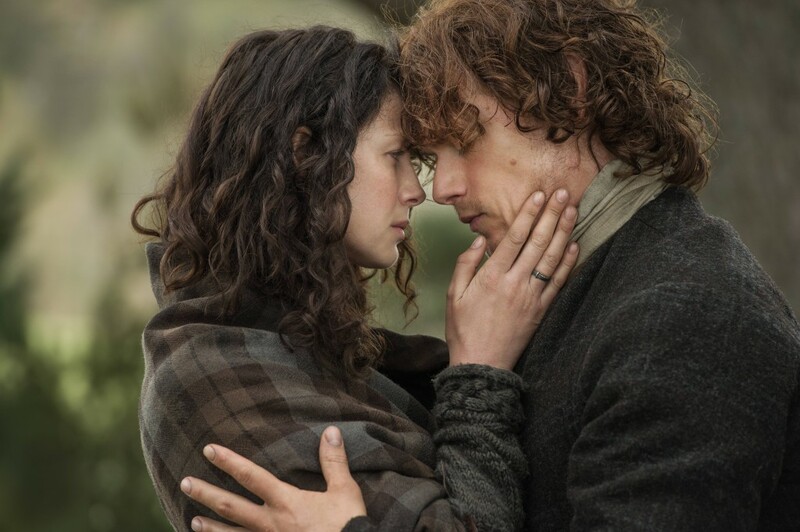 She begins to cry, but Jamie knows she is safer in her home time than with him. He walks away from her, but lets her know that he’ll stay near until night so he knows she’s safely home. Claire calls to him and says goodbye. He leaves amidst very dramatic music. Claire stares at both of her rings, side by side, deciding which life to live. She looks back at the smoke of his camp, but she can hear the buzzing of the stones now and approaches the one she must touch. Jamie is at camp asleep when we hear Claire’s voice ordering him to his feet and we realize that she hasn’t left after all, but has chosen to stay with Jamie in this time period. She asks him to take her home to Lallybroch and they kiss passionately. As I said, a GREAT episode and very well done, in my opinion. The reason this was my favorite part in the book is because it’s where she finally makes that choice to stay with Jamie. Before this, she was always half with him and half in her home time with Frank. But now, though she loved Frank, she knows that this is where she really belongs. Let me know what you thought of this recap/review and the episode in general! Happy watching!! This entry was posted in Bill Paterson, Caitriona Balfe, Episode Reviews/Recaps, Lotte Verbeek, Mike Barker, Nell Hudson, Sam Heughan, Toni Graphia, TV Show Clips and tagged Bill Paterson, Caitriona Balfe, Diana Gabaldon, Episode Clips, Lotte Verbeek, Mike Barker, Nell Hudson, Recaps, Review, Sam Heughan, The Devil's Mark, Toni Graphia by Johanna Underwood. Bookmark the permalink.